- Fuel Gauge. Open-UPS provides accurate fuel gauge capabilities by precisely measuring the input and output current flow. 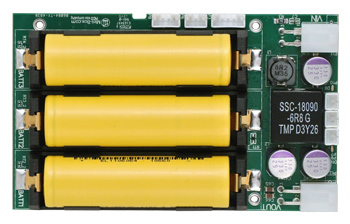 In case of low battery situations, the system can send an ON/OFF pulse (or by reporting remaining battery capacity via USB) to a motherboard in an attempt to gracefully shut down the system. - Intelligent UPS, USB interface, SMBUS slave. Communication can be done over USB and the device has also SMBUS reporting capability. Windows detects OpenUPS as Battery and automatically shows battery in the system tray. OpenUPS2 has Windows support and API allowing developers to interface to custom applications.